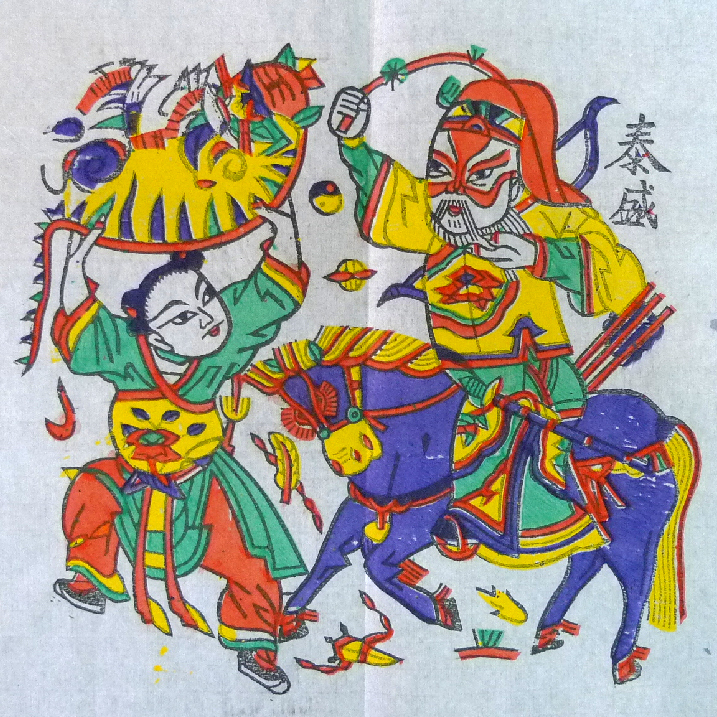 The story of this wood block print comes from the Ming dynasty novel 殘唐五代史演義, a fiction set in the late Tang and 5 Dynasty 10 Kingdoms Period (around AD 900). Though having less literary merits as the Romance of the 3 Kingdoms, the story of the novel has been adapted into opera and craft works. The scene from the story goes like this; one night the Jin Emperor dreamt that a tiger has entered into his tent, he saw it as an omen of the arrival of a great fighter. The next day, he met a young fighter who was powerful as well as courageous, able to lift up a tiger with his bare arms. The emperor made him as one of his 13 adopted sons (Tai Bao) and name him Li Cun Xiao.